Maintain temperature control to provide a safe and stable environment for your tank inhabitants with the Finnex HMO Titatium Digital Control Heater. Digital accuracy within to +/-2°F keeps water temperatures at a constant level. Finnex Digital Titanium Heaters implements new technology for precision digital control for maintaining water temperatures at a constant level. The titanium tubes are corrosion-resistant and virtually unbreakable. These advanced heaters create a safe, healthy, and stable temperature by maintaining water temperatures within +/-2° F of the set value for your tank. Additionally, Finnex HPS heaters are equipped with memory. so in the event there is a power outage, your heater will resume your preset temperature settings at startup up. Please note that the digital LCD display reads in Fahrenheit. I bought two of them to heat water for my water changes. I wish I could give it zero stars. I noticed they were definitely reading wrong to begin with when I put them in the water. When the water hit 78.6 I had one of them set to the highest possible temperature of 92 (that one took about 2-3 seconds to go up a degree, ha). The other one I had to set to 88 to get 78 degree water. Can't trust them at all even for water changes, and I would never ever put one in my tank. I went the next size up than recommend for my tank. Heater does good and only a half degree swing on each side. How ever as other mention the temp showing is 3-4 degrees higher than actually tank temp. Tank runs around 78 when controller shows 81. If off this much I would assume over time it could swing more. Does take about 48 hours to find its stable point from initial setup. I would recommend to not OVER work this heater. Titaniums are known for failures if you purchase too small of a heater. These heaters are pretty nice. They are made of good quality materials. I do wish the heaters digital controller would be a little nicer but, overall the package is nice. I run 2 of the 200W ones in my 150G system. I have a temp window of 78-79 controlled with my Apex and they heat up the tank super quick. 4 Stars because one failed after 1 year. Just purchased a replacement for it same model. I trust these heaters. Seems to heat consistently. Had to set the controller at 82f to get a tank temp of 78f. Does Finnex even have quality control? Apparently not. As mentioned in many reviews the thermometer device within this unit is atrocious. I have it set on max temp somewhere around 95 degrees and somewhere around 77.5 degrees actual water temp (verified +/- .5 or so through various thermometer devices) the heater registers 95 and will not send power to the heating element. I choose to use units with an independent thermometer control in the case that there is a temp probe malfunction with the Apex unit. Well this piece of crap will not function above 78 degrees and I prefer to run 78-79. I read the reviews and got 2 anyway. The temp probe is part of the heating element housing and it tries to "estimate" the temperature which in my case reads from 80-84 degrees when it is actually about 78. I don't mind it reading high but it wanders over 4 degrees with the water temp being consistent. I checked it with a recently purchased calibrated thermometer while mixing water in a trash can. Using it with an Apex controller I had to set the temp at 85 for it to consistently stay on with the Apex programmed with 78.3 and 78.5 range. The problem is the location of the temp probe (built in to the heater housing) and the "estimating" the heater does to try and read the temp of the surrounding water. I really like the ViaAqua heaters, wish BRS carried them. I just replaced 2 in my tank, one for 3 1/2 years. I have purchased 2 new ones and the Finnex heaters are in the trash. I am NOT happy with my purchase, PLEASE believe the reviews about the heater, the controller is set at 82F and the water in a 30 gallon system is 78.6F. Purchase a Neo-Therm if you need something under 150w. I am in the process of replacing the Finnex with a 150w Neo-Therm, personally I should have believed the reviews. I thought I was buying a good heater but I put my hand in the tank today and realized it's pretty cold so I set up three different thermometers in my tank and all three were reading in the 73 range while the heater was set at 78 and not even heating. I guess I'll have to boost it up to get all the thermometers reading 78. My poor livestock! The thermometer for the heater is built into the body itself, so the heater cannot get accurate temperature readings of the tank. When it turns on and heats up, it reads the tank as warm and switches off again. It almost froze our 125 gallon reef. I've been through two with the same problem. Bring back the old model with the separate temperature probe! I really like the digital part. I have had good luck with the heater so far. I have checked the temp. with another unit I trust and both register great. As with many reviewers here, I must set the heater much higher than the water temp needed. As it stands now I must set the Heater Temp at 89 degrees F to get a water temp of 78.5 +/- ...This is totally unacceptable. I have the 300 in a 29 gallon sump feeding a 75 gallon display. What is the length of the 150w? The length is 7.8" you will need 9" of clearance to handle the cable from the top. 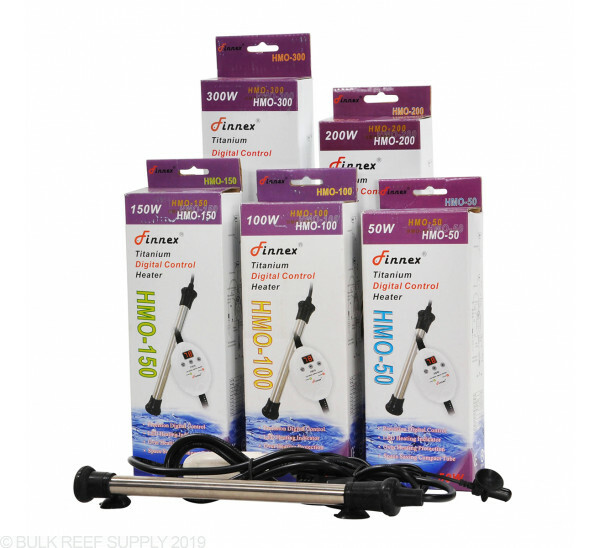 Would 2 HMO-200 Finnex Heaters work for a 120 gallon reef tank? 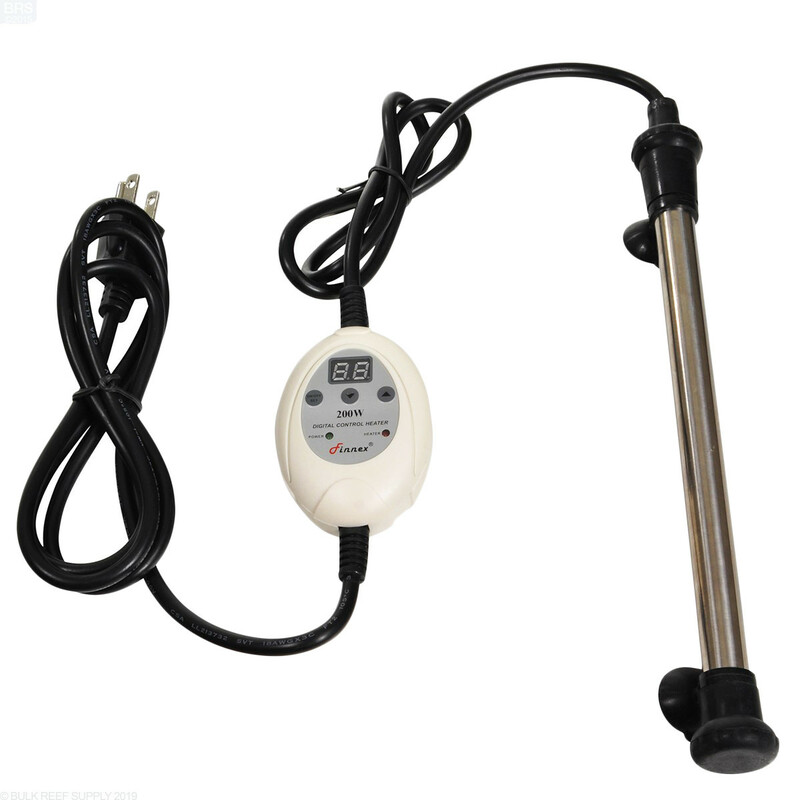 The 200w HMO heater is good for tanks around 60-80 gallons and two of them would be perfect for a 120 gallon tank. Thanks for the question and if you have any more just let us know. How long is the 100w? Would it fit in the back of an Innovative Marine Nuvo 20? The 100w model measures 6.6" long and would certainly fit in the Nuvo 20. How long is the 200W heater? The 200 watt will be 11" long. Feel free to let us know if you have any further questions! 2x 300 watt heaters would be a perfect set up! Feel free to let us know if you have any further questions! Would 2 300w heaters work in a 215g? I figure with the rocks it prob. more like 200g of water? Also, can I lay them down flat on the bottom of the sump? 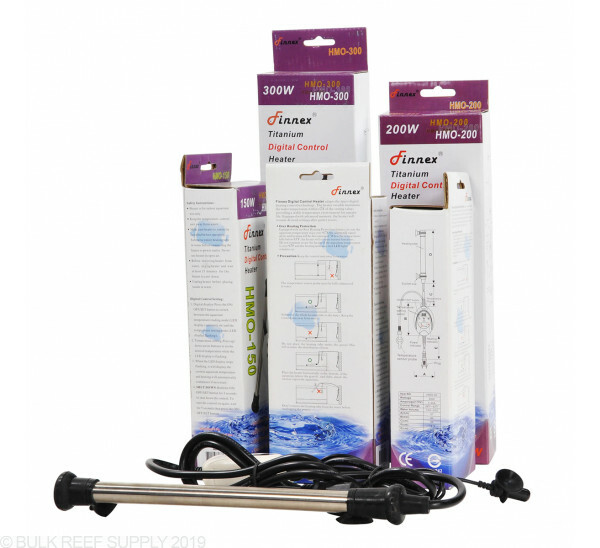 Two 300w heaters may be a little underpowered for a 300g aquarium. It is hard to say exactly though without knowing the ambient temperature of the house, and a few other factors besides total water volume. You can always start with two heaters and then add a third down the line, or start with three and then if you only need two, pull one out to keep as a backup. The Finnex heating tubes can be oriented in any direction. The Finnex HMO 200 heater is approximately 10.5" long. Have a great day! Can the Finnex HMO be mounted in the tank vertically, or is horizontal mounting the only option? The HMO heaters can be mounted in any orientation and it shouldn't cause any issues. Thanks for the question and if you have any more just let us know! How long is the 300W heater? The Heater is 12" long exactly. However 13" clearance would be needed to fit with the chord coming out of the top of the heater. Feel free to let us know if you have any further questions! Are the finnex heaters grounded, do they have a three pronged plug? The Finnex HMO heaters do have a grounded outlet plug. Hello, I have a 120 gallon tank with 30 gallon sump and looking to update my heater. I wanted to add 2 but wanted both to be able to handle the tank is one is to fail. I see the measurements you provided and tank size but could you fill in the blanks for acutall length and area needed for these to fit ? I have 220 gal aqurium . Will 2 300 watt heater be enough ? You will need between 550-1000 Watts in your system. 2x 300 watt heaters would work well! These are submersible and the cord from the wall to the controller is 4 feet and from the controller to the heater is 2 feet. Feel free to let us know if you have any further questions! I am starting a 55 gallon salt water. If I add a protein skimmer what size would I need? If I dont add the skimmer will the size suggested be to much? Hey there! I would recommend a 200W heater for your size of tank. The use of a skimmer doesn't change the water volume of your tank, so no need to worry about including it in the sizing of your heater. :-) Happy Reefing! IF MY TANK IS 60 GALLONS WOULD YOU RECOMMEND THE HMO-150 OR HMO-200? 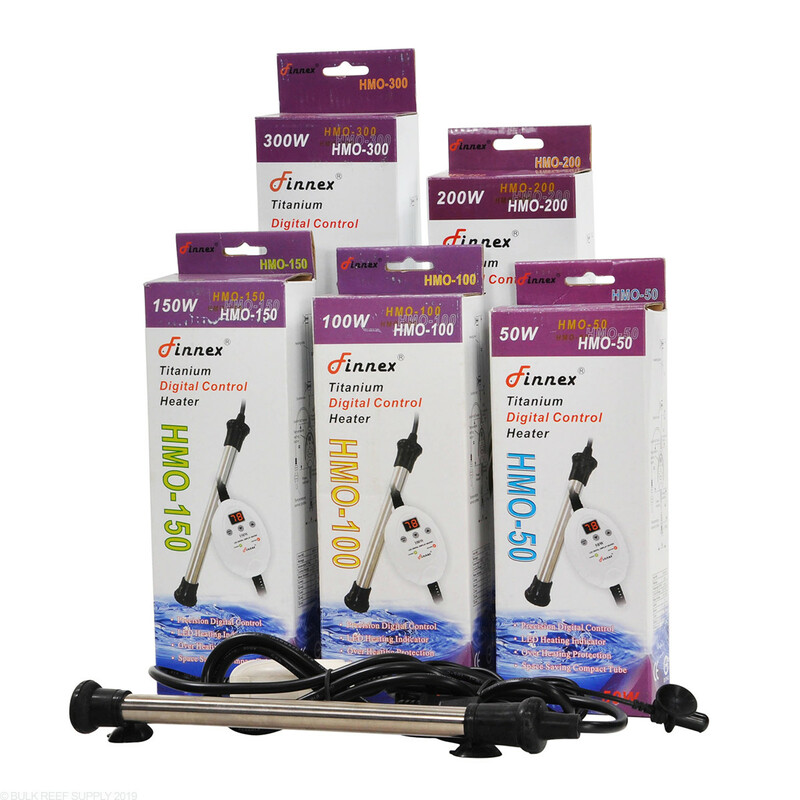 For a 60g tank we would suggest using the 200w heater. Its best to err on the larger size in case you need it (say you have a particularly chilly day). I have a 54 corner with sump. If I want to go with two heaters so one is a spare if one fails could I get one without controller as backup set low and the other with controller set-up? If this is acceptable what size would you recommend? Also do you recommend them in the skimmer section or pump section? Thank you. You can certainly select 2 heaters one which the controller set to a slightly lower temperature. For this size tank you will want 2.5-5 watts per gallon around 250 watt total. Here you could select 2 150 watt heaters to work well and place in the same section of the sump if needed! Typically you will want between 2.5 watt to 5 watts per gallon. Ideally the 100 watt will work great with the 20 gallon tank. Feel free to let us know if you have any further questions! What size would you recommend for a 29 Gallon JBJ Nano Cube? And more importantly, will it fit in the back?? You will want 100 watt heater for best performance. These will sit in the back no problem. Feel free to let us know if you have any further questions! I have a 92 Gallon Corner Bowfront with a 20 Long Sump and a 40 Breeder Frag/Refugium all plumbed together. Would you recommend 2 300 Watt heaters for this? Also, is the "controller" one that will kill the power to the heater if it gets stuck in the on "position"? Lastly, what would you recommend for a 29 Gallon JBJ Nano Cube and would it fit in the back of the filter area? For the initial set up 2x 300watt heaters would work out great! The controller is the part which turns on or off depending on temp in the water column. For a 29 gallon tank we recommend anywhere from 75-150 depending on room temperature. usually 75 watt is plenty. Feel free to let us know if you have any further questions! Do have a controller that controls both the heater and the chiller ?? For something like that you would be best served by an aquarium controller. 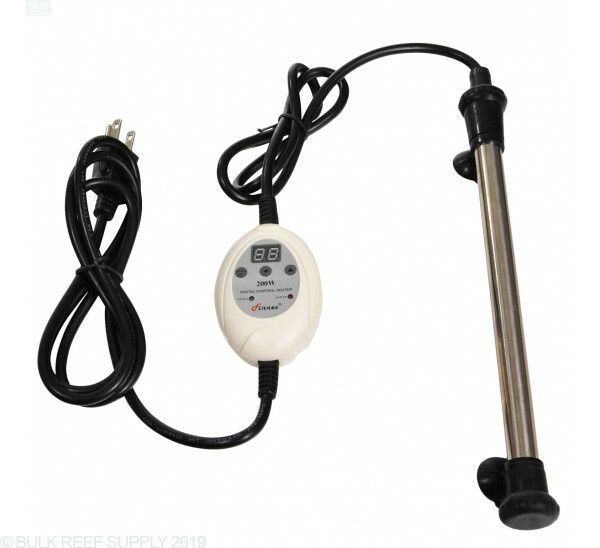 The most basic of which is the Reef Keeper Lite unit and it will do both of those things as well as give you two more outlets you can use as timers or other functions.